The global cancer diagnostics market is segmented on the basis of technology, application, and region. Based on technology, this market is categorized into platform-based and instrument-based. The instrument-based segment is expected to account for a major share of this market, in 2015. The platform-based technology is further segmented into next-generation sequencing, microarrays, PCR, flow cytometry, in situ hybridization, immunohistochemistry, and others. Instrument-based cancer diagnostics is further segmented into imaging systems and biopsy. On the basis of geography, the market is divided into North America, Europe, Asia, and the Rest of World (RoW: Latin America, Pacific countries, and Middle East and Africa). Technological advancements in various fields such as biomarkers, imaging, biopsy, endoscopy; growing number of cancer cases, rapidly rise in geriatric population, awareness initiatives by governments, and increasing government funding are major factors driving the market growth. However, high capital investment and low benefit-cost ratio of biomarkers and dearth of skilled professionals pose restraints to the growth of this market. Improving healthcare infrastructure in emerging countries and growing demand of companion diagnostics offer growth opportunities for the this market. Some of the major players in the global market include Agilent Technologies, Inc. (U.S.), Thermo Fisher Scientific, Inc. (U.S.), Illumina, Inc. (Denmark), Becton, Dickinson and Company (U.S.), GE Healthcare (U.K.), QIAGEN N.V. (Netherlands), Abbott Laboratories, Inc. (U.S.), Roche Diagnostics (Switzerland), Siemens Healthcare (Germany), Philips Healthcare (U.K.), and C.R. Bard, Inc. (U.S.). The cancer diagnostics market is highly competitive with a large number of big and small players operating in different market segments. Based on technology, this market is categorized into platform-based and instrument-based. The instrument-based cancer diagnostics segment is expected to account for a major share of this market, by product, in 2015. Based on application, this market is segmented into lung cancer, breast cancer, colorectal cancer, melanoma, and others. 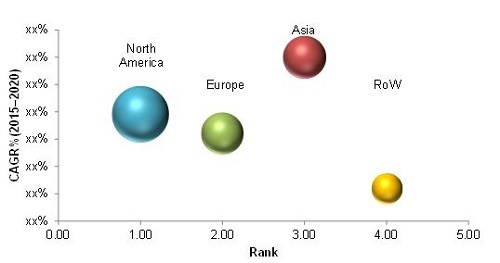 Breast cancer is expected to account for a major share of the cancer diagnostics applications market in 2015. Technological advancements in various fields such as biomarkers, imaging, biopsy, and endoscopy; growing prevalence of cancer, rapid rise in aging population, increasing number of awareness initiatives by governments, and growing government funding. However, high capital investments and low benefit-cost ratio of biomarkers, and high cost of diagnostic imaging instruments pose restraints to the growth of this market. Improving healthcare infrastructure in emerging countries and growing demand of personalized medicines offer growth opportunities for this market. On the basis of regions, this market is classified into North America, Europe, Asia, and the Rest of the World (RoW). The global cancer diagnostics market is expected to reach $13.1 Billion in 2020 from an estimated $7.1 Billion in 2015, growing at a CAGR of 12.9%. The market is dominated by North America, followed by Europe, Asia, and Rest of the World (RoW). The market in Asia is expected to grow at the highest rate from 2015 to 2020. Some of the major players in the global cancer diagnostics market include Agilent Technologies, Inc. (U.S.), Thermo Fisher Scientific, Inc. (U.S.), Illumina, Inc. (Denmark), Becton, Dickinson and Company (U.S.), GE Healthcare (U.K.), QIAGEN N.V. (Netherlands), Abbott Laboratories, Inc. (U.S.), Roche Diagnostics (Switzerland), Siemens Healthcare (Germany), Philips Healthcare (U.K.), and C.R. Bard, Inc. (U.S.).